it is not working on ios 8…..have u tested it on ios 8 too??? its workin fine on ios 7…but cnt get locztion after terminating app on ios 8…pls rply soon…thanx..
Hi, It should work on iOS 8 as well as I have asked a friend to help me test it a few weeks ago. Can you double confirm on this? I don’t have an iPhone with iOS 8 for testing right now, I only have iPod Touch (with iOS 8). I have tested with iPod Touch Gen 5 (iOS 8). It works well. What surprised me was even it does not have 3G, it was able to get the location when I was driving. So, you must be doing something wrong on your end. hi @ricky , its very helpful for me . I want to access the location everytime like didlocationchanges return the location , when app have been terminated. I can also confirm this works well on ioS8 (iphone 5c) though struggling a bit with coming up with a mechanism to start and stop. I can get the location updates to stop happening when switch is set but when I leave connected I can see in log view that the background tasks are still being triggered. I think in a previous post Ricky you mentioned you implemented toggling the background updates on/off – any clues on how you did that? Thanks for your confirmation. 😉 I think when we monitor the significant location changes, we do not really need to stop the location manager. The solution for the current post does not use any background task as well. By “previous post”, you meant this article: http://mobileoop.com/background-location-update-programming-for-ios-7 ? It is different comparing with the current post. endAllBackgroundTasks. I just updated the solution on Github by adding “-(void)endAllBackgroundTasks;” on the public API. FYI, if you want to monitor significant location changes and also sometimes getting the user location updates in a specific time interval, you would need 2 different locationManager instances to do 2 different tasks (Monitor significant location changes versus getting location in the background). it working fine when app is terminated but os is active with other tasks i.e. screen is not locked.But in sleep mode i.e. when screen is locked all the time app is not resuming back in ios 8. Yes, that could be the reason as I never do a testing when the app is active/the screen is locked as I assume it would work. Have you tried to test that by driving for over 500 meters and over 10 minutes? I am going to make a trial run (put the app in the background and locked the screen) and see how it goes on my iPhone 4S and iPod Touch Gen 5.
no actualy i said when app is terminated and os in sleep mode i.e screen locked.In background modes its working fine.Problem area is when its app is when you are doing nothing with your phone and simply travelling around.App do not resume in this case. Actually, I still don’t quite get what you meant. Can you list down the cases like the examples below? Case 2: App is launched and then putting in the background, locked the screen. Driving around for over 30 minutes. Status 2: Not Working, not able to get the location on the PList. Please list down the cases as detailed as possible. Thanks. Case 1: App is terminated by the user after opening (Not in the background)but user is using other apps or receiving calls etc. Case 2: App is terminated by the user after opening (Not in the background) and locked the screen. Driving around for over 30 minutes. I am not talking about background the only case i am facing issue is after terminating and screen is locked. Thanks for the info. “screen is locked” means that you will have to the Passcode is On and you will have to enter a passcode every time when you want to open your iPhone. Right? I will test the app on locked screen when I have some free time. Ok. Thanks for the information. I will test on my devices and see if I am able to find a way to fix it. It will take a while as I am busy with other projects. First of all thanks for the great code I’ve found on this website(especially “Getting Location When Suspended” and “Background Location Update Programming for iOS 7 and iOS 8”). 1. You forget to add NSLocationAlwaysUsageDescription key into Info.plist which is necessary for using localization services, even significant change monitoring. 2. From Apple docs property “desiredAccuracy” in CLLocationManager is not used when monitoring significant location changes. I just downloaded the project from GitHub, the NSLocationAlwaysUsageDescription is there on the Location-Info.plist. Please double check. Yes, “desiredAccuracy” might not be needed. I will remove that and fix the potential bug that PRASHANT mentioned when I am free. I need a help, i have implemented the solution as per in this website. It works really well when the app is in the foreground as well as in the background. But i am unable to make my app work if the user kills in the multitasking or terminate the app in the background. I have included the StartMonitoringSignificantLocationChanges but it doesn’t work..Please help on this. Even when the app is killed, it should work pretty well. You must be doing something wrong. The only thing that I am unsure is on the locked screen. You have to help yourself by doing more testing on the solution. Is region monitering also a solution for this? ?I think aaps like life 360 are tracking location by region monitering. Life 360 has implemented tracking perfectly on ios 8.Who they have implemented this?? You may take a look at this post: http://mobileoop.com/ios-region-monitoring-and-location-manager I have implemented the region monitoring. But I didn’t test on that for quite a while. There might be some changes or problems that I don’t know yet. Life360 has raised over $75 millions funding and it has over 75 employees. I believe there are at least 10 mobile apps developers. May be even more than 20. If I am able to focus entirely on the location services APIs, I might be able to find the solution as good as Life360. The problem is I am working in a few projects at the same time. So, I don’t have much time to do R&D on the Core Location APIs. I will do that when I have free time. I think there are other people who share a more complete solution for Region Monitoring on Github, you just need to do more search. I simply don’t have time to compile a complete solution and upload to github. How about the battery drainage ? Battery drainage for startMonitoringSignificantLocationChanges is definitely much lesser than startUpdatingLocation. It is actually a better method. Will there be any issue with the Apple approval with this implementation ? It will not have problem passing through the Apple approval process as it is not a private API. I don’t have time to fix the “bug” at the moment. I am not sure if it is a bug or it is designed that way. How about help me do some testing with other popular apps such as Waze or Google Navigation and see if they will be working when it is on the locked screen as well and report back? Tahnks. Thanks for your article. Iam trying to implement both startupdatingLocation and startMonitoringSignificant in order to make the app to get the location when the app is foreground or background or killed. But I could nt. Please provide your suggestions . You will have to have 2 different locationManager instances to handle these 2 different functions. Is there any way to stop location monitoring after user manually kills application? (from the task manager) Because it can be very annoying to see phone updating location all the time, even if app is terminated by user. From one side, appWillTerminate should be called, and we can call for stopMonitoringSignificantLocationChanges. But it doesn’t work always. Have you thought about this by any chance? I did some testings on applicationWillTerminate some time ago, it has never been called. I am not sure the exact reason. I just made a quick google search and I found this: http://stackoverflow.com/questions/7818045/applicationwillterminate-when-is-it-called-and-when-not You might need to add a key “UIApplicationExitsOnSuspend” on your PList. If that would not help, may be the best you can do is whenever application:didFinishLaunchingWithOptions receives the key “UIApplicationLaunchOptionsLocationKey”, just stop monitoring the location from there. Thanks for your answer, Ricky. I have 1 more question for you, if you don’t mind. After upgrading to Xcode 6 my application stop updating in background on IOS 7 devices. It works, but just not updating location when app is on background. When I’m using IOS 8 – it works like a charm. Did you have such kind of problems? Now I have Base SDK 8.1 and Deployment Target 7.1. Hm… that’s weird. If it happens on iOS 8, I believe it might due to a key that you have to add inside the PList. But for iOS 7, it should work as intended. I suggest you to recheck everything on that device with iOS 7. Its working in life 360 when screen is locked. Ok. Thanks for the info. When I am free, I will do more testings. See if I am able to come out with a solution. It will take a while. Is it possible to make a server call to send the location details when the app is killed ? Yes, it is possible. I have been doing that on the app that I am developing. Just send the coordinates to the server from locationManager:didUpdateLocations. Nice Post. Is this possible to update location information to server when app is killed? Can we fire a local notification when app is terminated by user or suspended by iOS (not immediately) and there’s a significant location change? Sorry for late reply. I actually forgot about this comment. As far as I know, I couldn’t get anything from the app delegate function “applicationWillTerminate” normally. Only after adding the key “UIApplicationExitsOnSuspend” on PList, then only I will get a response from “applicationWillTerminate”. But be really carefully on this, if you read the apple document on the “UIApplicationExitsOnSuspend” key. It says: The app should be terminated rather than moved to the background when it is quit. Apps linked against iOS SDK 4.0 or later can include this key and set its value to YES to prevent being automatically opted-in to background execution and app suspension. When the value of this key is YES, the app is terminated and purged from memory instead of moved to the background. If this key is not present, or is set to NO, the app moves to the background as usual. I have tried on my app. When I am moving the app to the background (tapping on the home button), the iOS actually kills the app. To answer your question: If your app does not need to run in the background, Yes. You may implement the key and schedule to run a Local Notification whenever the app is terminated. If not, I believe there is No way to do that. For significant location change, Yes. Just follow the way I implement the key “UIApplicationLaunchOptionsLocationKey” on didFinishLaunchingWithOptions up there. 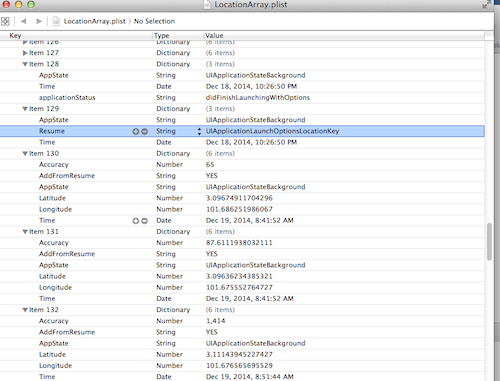 You may schedule a Local Notification whenever the didFinishLaunchingWithOptions contains the key “UIApplicationLaunchOptionsLocationKey”. You are not able to get the location update for every N minute if you want to use startMonitoringSignificantLocationChanges. You will only get the location update after the device is moving at least 500 meters and only once in every 5 minutes. My own test: Every 10 minutes. I checked link which you given. But in that after kill or suspend application, location is not update. i want to update location also after kill or suspend application. any suggestion? If you want to get the location update after the app is killed/suspended, you can only use [locationManager startMonitoringSignificantLocationChanges], using this solution, you will not be able to get the location every N minute as it is the iOS that determines when to give you the location. The iOS will only return the location when the device has move for over 500 meters from the last known location and it will return the location at most once in every 5 minutes. Due to that, this solution will save some battery. [locationManager startUpdatingLocation], but when the app is killed, you will not be able to get the location. If you want to have both getting the location for every N minute and also get the location even when the app is killed/suspended, you will need to have 2 different location Manager instances to handle these 2 different functions. The complexity to use 2 location manager instances at the same time is at another level. Hi! I need to have both solutions but I’m very confused, how can i use 2 location manager instances? I follow your tutorial using Monitoring Significant Location Changes and works perfect. Now, if I want to get the location every N Minute how can i manage 2 locations manager instances? Maybe with another @property (strong,nonatomic) LocationShareModel * shareModel called shareModel2? Or I need to create another class LocationShareModel.h and LocationShareModel.m? I might not want to share the solution for having 2 instances of location manager working at the same time because I want to protect the my personal/company intellectual property. I believe there are more than 1 way to use 2 different instances of location manager at the same time. The one that works well for my app might not work well for yours. The 2 location services, that I shared on Github, have given you more than enough hints on how to do it. You just need to spend some time to do some experiments and combine these 2 solutions. I believe you will be able figure out a way to do that. I implementing a solution combining your two tutorials. I created two LocationShareModel. One that I am using for startMonitoringSignificantLocationChanges and another one for startUpdatingLocation. It seems that they work properly, but I discovered something surprising. The location update for every N minute in background works perfect. The amazing thing happens when the app is closed, when the SignificantLocationChanges is triggered for first time, the location update for every N minute begins to run again every N minute with the app closed. I can understand but its working perfect. But to be sure, you will have to run more testings and collect more data. You might face a certain situation where it is not working well. Then you might have to find a solution to fix that situation. I detect that when the app comes to background from foreground the first updatelocation callback is no calling stopLocationDelayBySeconds after 10 seconds. Is this normal? hi Kepa shall i need to create two instances in single share model or two share models. can we get location always with region monitoring as we are getting in significant change?have u found anty solution for that locked screen issue in ios 8?? The region monitoring works differently compare with Monitoring Significant Location Changes. For Region Monitoring, the app will only wake up when the device is crossing or leaving the regions that the app has monitored. On the other hand, if the app is monitoring significant location changes, the app will wake up when the device is moving at least 500 meters from the last know location (with at most 1 update for every 5 minute). Nope. I don’t have time to do the R&D on the locked screen issue yet. It will take a while. May be 1-2 months. I tested you solution and it is working fine thanks! From your experience, do you think it would be possible to grab more then one hi-res location update after waking from a significant location update? When the device is moving more than 500 meters from the last known location, you should get the location update. The location that you receive is an array of coordinates with timeframe and other info. So, you might be able to receive more than 1 location coordinates with more than 1 timeframe. – At most 1 location update in 5 minutes. If the device does not satisfy the above criteria but it is able to acquire new location coordinates, it will store the coordinates on the GPS chip. But once the criteria has been satisfied, iOS will send the array of coordinates to you through the location manager delegate methods. I don’t know what exactly that you want to do with the “approaching a target”. I believe you might be able to use iOS Region Monitoring technology here and the technology will also wake up the app from the background or terminated/suspended mode. We implemented in our app but it will not works when we suspended app it goes to “applicationWillTerminate” function but in your code it goes to “applicationDidEnterBackground” Please help me. I believe you have added the key “UIApplicationExitsOnSuspend” on your PList. With the key is implemented, your app will be suspended when you are moving the app to the background. If it is not an intention for the app that you developed, you should remove this key from the PList. If you don’t have the key “UIApplicationExitsOnSuspend” on PList, then “applicationWillTerminate” will not be called. The minimum range to get the location update is 500 meters AND you will get at most 1 update in every 5 minutes. If you are travelling more than 10 km in 5 minutes, you also will get 1 location update. – Assume that only 1 location update every 5 minutes. – 5 updates * 5 minutes = 25 minutes (Let’s round up to 30 minutes). Conclusion: You are driving at about 80km/hour. Ok Thanks Ricky. This significant location should get only we can move from one place another or if we stay in one place we can get the location for every 5 minute duration? iOS will only send the location update to your app when the device is moving over 500 meters from the last known location. Without any movement, the app will not get the location. But we have travelled more than 200 km in this week end. We have got most of the location about my travel that is fine. In that there was very long duration to getting the location update from one to another, i mean its took more than 50 minutes duration between two location updates. Can you identify the issue why this was happening? It could be anything. Your iPhone, your internet coverage and etc. Sometimes the GPS chip will store the location coordinates locally, you will receive an array of coordinates (with different timestamps) But sometimes due to very bad network (No 3G, only edge/GPRS or no network at all), GPS chip will not be able to determine the coordinates, thus, you are not getting any location update. have u noticed that you are getting location when your phone screen is locked or in sleep mode.thats may be the reason.Hi Ricky,have u tested it with locked screen?? Yes, i can remember i didn’t used my iPhone its simply in locked mode. But my entire travel it is in the same mode and i could received location update as well only the issue is some time it takes more than 50 minutes to gave another location update from old one. I have a question. I’m developing an app that needs to get the user location in background (even when the app is suspended or terminated) every 2 minutes and send it to my server. Is there a way to do this? This is an emergency app so the location tracking is the most important feature (no matter battery drain, the user is notified about it). I’ve been trying to combine the solution of this post with the one of the old post, but when the app is suspended or terminated I don’t get the location. Can you give me a clue of where to start looking? For me the “startMonitoringSignificantLocationChanges” is useless as I always need the location every 2 minutes. Thank you very much!!! Hi Danny, I have the same problem, but I don’t use significant location changes. I need to get the location every 2 minutes ALWAYS (foreground, background, suspended and killed by the OS). I’m still trying hard to find a solution. Would you like to share the code? But my users and me found very strange problem in this code, that I can’ t resolve for months. It starts sending coordinates from the past after few days staying in suspend mode. App have became in suspend mode, and first days it works perfect. I receive correct coordinates every 500 m.
I started traveling through 3 points A,B and C in few days. At first I get right coordinates between A and B but, then I’ve came to point C app sent me point B coordinates and it doesn’t meter if screen was locked or not. Each point is far enough from others. So, did you test your code for a long time staying in suspend mode? Thanks for gr8 solution above. I am having sharedGPSInstance. when user logs in significant location update has started. when user put app in background I stop significant location monitoring and start again. Then after traveling some distance i got the significant location update. On this update I am using startUpdatingLocation to start GPS to get continues GPS updates. I got the updates for 3mi. after that app is suspended. why the applicaiton is suspending? I am usgin same sharedGPSManger for location tracking. Thanks a lot for your post, it’s great ! I m following you since beginning and I reach a point that I am only wait “Lock Screen” issue to be solved. if you fix it then the full scenario will be brilliant, you know, all people lock their iPHONE ! 1) Do you find that when using the significant change service, the arrow icon is always present in the status bar, and that in “Settings>Privacy>Location Services”, the app always has a purple arrow icon? 2) In Xcode, is it necessary to set “Capabilities>Background Modes>Location” updates to on? -> Can I call webservice and send new location to server of my application? I wonder is whether the my application execute code while app was killed? Yes, I have the same question, will the app be able to send to the server about the location change to send a push notification for example, after being killed/suspended? And also can I use geofencing instead of location updates in the app?? I am doing same thing with my application as you have implemented in the code. While I am debugging, it works completely perfect even if the iPhone is locked and application is in background, But while I am testing the same thing in live environment, iOS suspend the application. See the crash log. CoreTime: Want active time in 4.40min. Need active time in 25.23min. Remaining retry interval: 1.466667min. CoreTime: Want active time in 4.60min. Need active time in 25.44min. Remaining retry interval: 1.466667min. CoreTime: Want active time in 4.79min. Need active time in 25.63min. Remaining retry interval: 1.450000min. : Application ‘UIKitApplication:com.BCT.com[0xe023]’ exited abnormally via signal. What I have done is I am playing with timer, i.e 150 seconds, a timer method will be called and location will be updated and the WS for updating location on server will be called. It works fine while application is foreground, I have googled out so many things and tried much for the same. I would appreciate if you can help me to solve this problem. From what you’ve said it seems that the best that the location services offers is an update around every 10 mins / 500 meters whilst in suspended mode. Are you saying that there is no way to get more frequent data whilst the app is in suspended mode? it’s helped out so so much. Do you know if this solution works on iPhone 4? We’re developing an app that track bicycle behaviour. Can we use the the event to start normal (detailed) collection of GPS data? Will this solution also work after the device is rebooted? I followed your tutorial and used the below lines in the plist to get the location in the background but App got rejected. Issue 1: We found that your app uses a background mode but does not include functionality that requires that mode to run persistently. This behavior is not in compliance with the AppStoreReviewGuidelines. We noticed your app declares support for location in the UIBackgroundModes key in your Info.plist but does not include features that require persistent location. Actually Rick’s way only include significant location updates, which do require locate as a background mode (but stills needs the “always” approval). Typo above : significant location updates, which do *NOT* require locate as a background mode. Can I call webservice and send new location to server of my application? i used your code but not find any proper solution. Can You plz Help me. simply Add “Application supports iTunes file sharing” key so You can get plist directly from iTunes. I am investigating there same issues, can we speak via mail? i think i’m getting in to this “if” but the local notification is not called. is there some things that cant be used in this method? I have implemented your solution in my app. My app is being woken up but I did not get the location. The location array doesn’t contains data. Thanks for the both tutorials! this is really helping a lot of issues I had in my app. Is there anyone which combining the two tutorials and is willing to share the code. I tried to do this but to be honest I do not now how to start. Thank you for sharing this valuable tutorial its really appreciating. when applying your source code i getting null launchoptionkey i am using xcode 7 & 4s device with ios 9. can you tell me why would i get this. 1. I really need to update location every N minutes. Could you share something about how to integrate with the previous post about get location every N minutes? 2. Could we integrate your example with PhoneGap/Cordova project? 3. Could we call some RestAPI to update location to server? Hi, Can we call the service from background mode or when tha application is killed. Please reply if you have any solution. have you find out any solution? but important point is that new this app works good on simulator location simulating!!! i have not any idea why!!!!??? Thank you very much for sharing the great tutorial and example! For iOS it works perfectly! Does someone has an idea if something similar is also possible with Android? (Start a background task of a terminated application) Is there a similar tutorial? Could also provide some help on implementing the same in swift. i have use your code in my project but i have one query , i want to start location update in background when silent notification appears and start update location to server how should do it in your code. i am trying but it stop after one or two call. you have any solution. Hi Ricky, Great article. Helped me a lot. But one thing. I am able to get the location updates when user puts the app in background. I can get location updates like this forever. But when user kills the app, I don’t receive the location updates. I would like to show you my code. Please let me know how can we connect. Hello Ricky, I have one project which needs to be update the location continuously after the app was terminated. I can send you an offer and we can discuss for the price. Please message me when you are available. Thanks. It is working on foreground and background state of the App. But it is not working/fetching location on suspended or terminated state. If Possible give me the source code for iOS swift as soon as possible.